The NHL trade deadline is a very interesting time of year. Players are being shipped to contenders, dropped from pretenders, waived, called up, you name it. At this point in the season we've seen a lot more trades leading up to the trading deadline which has some in the media perplexed as to whether all the action is taking place before the actual deadline on February 28th, or if it's just a sample of what's to come on the actual day. Consider that most NHL General Managers are copy cats. When Anaheim won the Stanley Cup in 2007, GMs around the league followed Brian Burke's approach of building a tough team that could intimidate opponents. 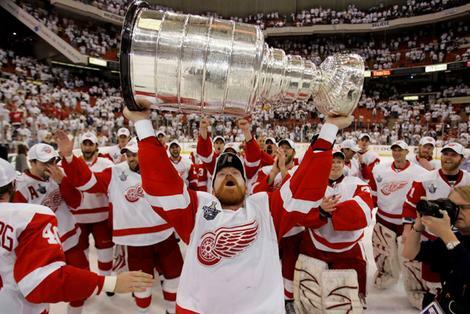 In 2008 when Detroit won the Stanley Cup based on skill and patience rather than toughness and retaliation, teams adjusted their blueprints to puck possession and power play proficiency. For evidence of this, look no further than Vancouver Canucks GM Mike Gillis. Even back in 2008, it was suggested in the media that Gillis follow this. So is it any surprise that when Carolina GM Jim Rutherford made some big moves prior to the deadline in 2006 (they won the cup that year) that other NHL teams are attempting to jump the gun and be proactive in the days and weeks leading up to the deadline? Whether it's Toronto or Ottawa offloading their veteran talent to contenders, or Boston, Pittsburgh and others trying to load up, it's evident that teams are trying to get better value for their assets by being proactive. Let's face it, making a deal right at the deadline is like having the clock called on you during a poker hand. You've got to make a difficult decision, and the clock is ticking. It could certainly force you into a bad decision, and we haven't even mentioned the factor that competition plays. If you're an NHL General Manager and you've got six defencemen on your radar as a hopeful deadline acquisition, as more and more of those are dealt, you've got more contending teams circling the bottom feeders like vultures. The one deal that surprised most was the Colorado / St. Louis deal that highlighted Chris Stewart, Kevin Shattenkirk and Erik Johnson. That was largely a hockey deal that needed to happen - at least for Erik Johnson. So while the Red Wings model is being emulated (and perhaps exemplified) by the Vancouver Canucks this year, the Flyers have reloaded and are perhaps using a Chicago Blackhawks model of depth at forward and defense at the expense of goaltending stardom. This may be best evidenced by the Flyers even going out and grabbing ex-Blackhawk Kris Versteeg. Pittsburgh's win in 2009 showcased the talents of Evgeni Malkin and Sidney Crosby. It's definitely difficult to emulate two franchise centers on the same team, but the Vancouver Canucks are trying their best with Henrik Sedin and Ryan Kesler, and Tampa Bay is hoping Steven Stamkos and Vincent Lecavalier can be an elite dynamic duo down the middle. You can be assured that other General Managers watch what succeeds in the post-season rather than the regular season. Teams that rely too heavily on one forward line have very little success in the playoffs comparative to their regular season success (see Vancouver Canucks of early 2000's, the San Jose Sharks or Anaheim Ducks of late, and the obvious choice, the Washington Capitals). Defence can also win championships, but despite the Bruins prowess defensively the past couple of years, they've been unable to get over the hump without a game-breaker at forward. Interesting note, as much as Brian Burke has been beaten up on this blog and the rest of the media for the Kessel trade, you'd think if Boston is a sniper short of a Stanley Cup this year than some heat might fall on the Bruins GM Peter Chiarelli for trading away a strong asset now for one down the road. Certainly in terms of assets the Bruins won that deal, but by the time Seguin evolves into the player he is supposed to be, the window of opportunity in Beantown may have closed. Regardless of the blueprint described by a General Manager, they're always subject to change based on whoever wins the Stanley Cup this year. Some GMs seem to do that, yet others seem to have no plan or blueprint at all.... the Atlantas and Floridas and Nashvilles of the world? NHL Trade Deadline: Canucks to add toughness?